Proton Commerce Sdn Bhd (PCSB) was incorporated on 27th October 2003 and started its operation on 1st March 2004. It is a 50:50 joint venture company between Proton Edar Sdn Bhd (PESB) and CIMB Bank Berhad (CIMB). It offers competitive hire purchase loan financing packages to new Proton car purchasers through PESB sales network nationwide. With the combined infrastructure of the two entities, PCSB can offer better deals for Proton car financing together with fast application and approval processes. In addition, customers enjoy value-added financing packages with a combination of other financial products. All this with the assurance and reliability of two established parent companies that are well equipped with the expertise and infrastructure. Proton Commerce is committed to delivering competitive hire purchase finance facility by leveraging on the synergy of the core competencies and resources of its parent companies, with a focus on providing fast, efficient and friendly service to car buyers. Thus, by leveraging upon these multi-faceted strengths, Proton Commerce’s objective is to become the preferred automotive finance provider for all purchasers of new Proton cars while being recognised as the most competitive, comprehensive and capable player in the automotive financing industry. To market, promote and sell the auto hire purchase packages. Build rapport and maintain good relationship with the sales networks. Ensure that loan applications are in compliance with the policies and business rules specified from time to time. To prepare daily, weekly and monthly report. 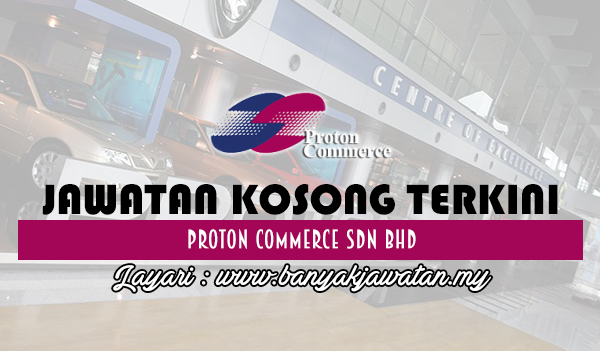 0 Response to "Jawatan Kosong di Proton Commerce Sdn Bhd - 14 Oktober 2018"